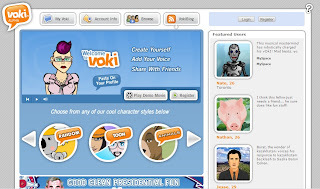 Voki is a voice community, that allows people upload their voice to its site. Actually, I don't know what this site doing, I browser some people and found their voice are not real, I mean their voice from robot. You can put your voice onto your blog or website. I didn't look more detail, I don't think it cost anything except make fun.